Magento 2 Barclaycard Payments extension by Meetanshi ensures secure online payment for Magento 2 store through UK's leading Barclaycard payment gateway. Secure online payment is the core of the E-commerce business. Magento 2 store owners need to establish a secure system that ensures customers safe payments. 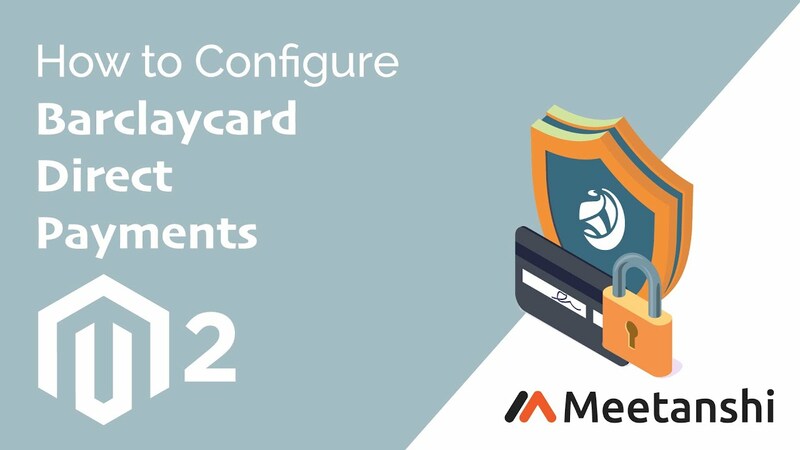 Meetanshi has developed Magento 2 Barclaycard Payments extension to enable Magento 2 store owners to capture secure online payments through UK's popular Barclaycard Payment gateway. Barclaycard is a multinational banking and financial services company with 48 million customers in more than 50 countries. It's the most prestigious & trusted brand and it has established popularity in the card payments in the UK and thus integrating the payment gateway in Magento 2 store benefits your both brand image and reputation. Magento 2 Barclaycard Payments extension enables accepting two types of payments: ePDQ Direct payment and ePDQ hosted payment. While ePDQ direct payment enables payment captures on site, ePDQ hosted payment enables checkout using a hosted payment page for secure transactions using 3D secure and CVC verification. Enjoy a wide customer base of Barclaycard users for your Magento 2 store by integrating the Barclaycard payment gateway and grow your business rapidly. To use the module, one needs to sign up for a merchant account in Barclaycard and get the API key for integration with Magento 2 store. Barclaycard also provides a test merchant account for testing payment processing before going live. The card details are stored in the merchant's servers and sent to the payment gateway using encryption. Merchants can handle more customers as card data stored and processed on their own website. Option to set default settlement currency. Use of hash algorithms to provide data and payment security. Admin can create orders from backend using Barclaycard Payment method. Set prefix for the orders placed through this payment method. Support for Authorize as well as Authorize and Capture payment action. Select order status for the new orders placed using this payment method. Select credit card types to accept payments. Encryption is used to exchange card and payment data with the Sage Pay server. 3D secure payment processing for protection against theft. Advanced protection for customer card details. The payment details are sent to order Email. Also, the payment details are stored in customers' My Account section and order view section in the backend. Support for all type of major credit and debit cards along with Paypal. Sha-In and Sha-Out phrase for data verification and transaction feedback. Use of hash algorithm for enhanced security. Enable sandbox mode for the testing functionality. Add payment description to show on the hosted payment page. Select the button background and text color to match with your theme. Add order prefix to identify orders placed using this payment method. Add instructions to show on the checkout page. Barclaycard payment details in My Account section, order view page and order Email. Good job done for the Barclaycard payment integration with Magento 2.